Wade Anderson has submitted an early history of the county and area. For a more in depth history of Boyd County, please look at the Boyd County chapter of Who's Who in Nebraska, 1940. James E. Boyd was born on September 9, 1834 in Tyrone, Ireland and immagrated to Nebraska at the age of 9. To view the complete biography of James E. Boyd, please take this link. 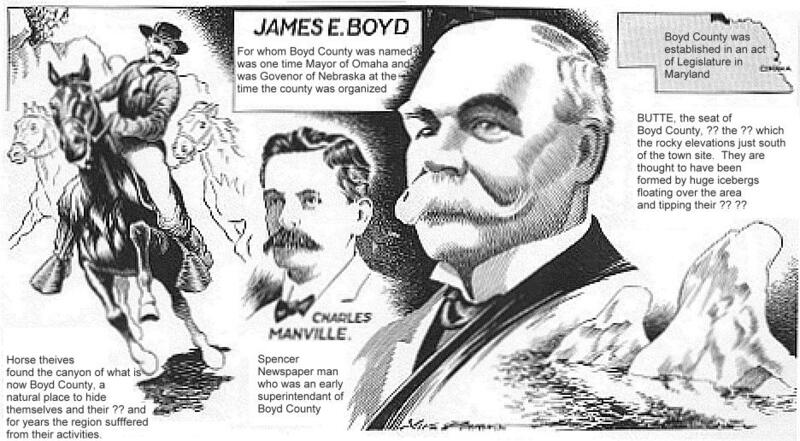 Among his other accomplishments, James E. Boyd was also Mayor of Omaha in 1881-83 and also1885-87; member of the Nebraska state House of Representatives in 1866; and delegate to Nebraska state Constitutional Convention in 1871 and 1875. 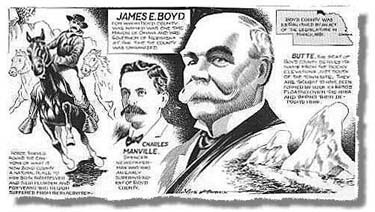 James E Boyd died April 30, 1906 and is buried in the Forest Lawn Cemetery, located in Omaha, NE. To view the image above in a clearer and larger format, please click on the image.